Join Bunny for a top-secret trip to the library in a story that celebrates the love of reading—the perfect Easter gift for all the bunny-lovers in your life! Bunny loves to sit outside the library with the kids and listen to summer story time. But when the weather gets cold and everyone moves inside, his daily dose of joy is gone. Desperate, Bunny refuses to miss out on any more reading time and devises a plan to sneak into the library at night . . . through the library’s book drop! What follows is an adorable caper that brings an inquisitive, fuzzy bunny and his woodland pals up close and personal with the books they have grown to love. 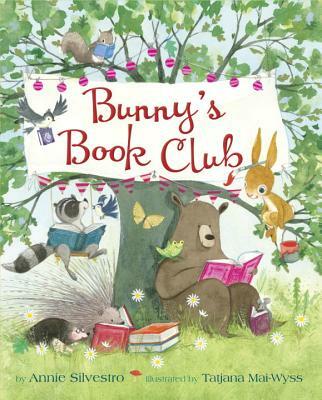 A warm celebration of the power of books, Bunny’s Book Club is sure to bring knowing smiles to any child, parent, teacher, bookseller, and librarian who understands the one-of-a-kind magic of reading. ANNIE SILVESTRO, author of Bunny's Book Club, grew up on the Jersey Shore. After graduating from St. Paul’s School and Georgetown University, she moved to New York, where she worked in the editorial departments of Harper’s Bazaar, Talk, and Allure magazines. She later returned to New Jersey, where she currently lives, to start a family and to focus on her passion, writing for children. Visit Annie online at anniesilvestro.com. TATJANA MAI-WYSS was born in Switzerland and has lived in Europe and the United States. She has illustrated more than a dozen books for children, including Bunny's Book Club, and is also a frequent contributor to Babybug and Ladybug magazines. She won the Giverny Award for Best Science Picture Book for A Tree for Emmy. Tatjana lives in South Carolina with her family. Visit her online at tatjanamaiwyss.com.